Peirce Mill is the only surviving grist mill along Rock Creek, but in the eighteenth and nineteenth centuries the creek’s waters powered as many as 26 mills, at least eight of which were within the District of Columbia. The mills ground primarily grains—wheat, corn, and rye—although there were also bone and plaster mills, a woolen mill, saw mills and several lime kilns. Most of the mills operated as “custom” mills, meaning that farmers would bring grain for milling, and the miller would take his payment in the form of a percentage of the flour produced from the grain. A few of the mills located in and around the port of Georgetown were “merchant” mills. These larger facilities purchased grain in relatively large amounts from farmers and sold their flour to merchants, often for distribution elsewhere along the eastern seaboard. Adams (Columbian) Mill – Located within the bounds of the present National Zoo, the Columbian Mill was built in the 1790s. Two mills were on the site, a plaster mill and a wheat flour mill, but little is known about the plaster mill. The wheat mill was a large, 4-story brick structure, measuring 50 by 54 feet, with 5 pairs of millstones and a 16-foot diameter water wheel. In 1823 owner George Johnson, facing dire financial straits, convinced his distant relative, future U.S. President John Quincy Adams (1767-1848), to purchase the mill and retain Johnson as its manager. The mill subsequently was known as the Adams Mill. Because of poor management by Johnson and others after him, Adams continually lost money on the mill’s operation. Finally, in the last year of his life, his brother-in-law took over and succeeded in producing a small income. The mill continued to operate until 1867 but was subsequently torn down. By the turn of the century, every trace of the mill had disappeared. An historical marker is now located next to the bike trail along the creek. Blagden and Argyle Mills – This pair of mills was located less than a mile upstream of Peirce’s Mill, on the west bank of Rock Creek a few hundred yards north of where Broad Branch merges into Rock Creek. They were likely built sometime in the 1790s and were owned by Thomas Blagden, a prosperous landowner and farmer who had been one of the builders of the U.S Capitol and other major government buildings in Washington City. Blagden’s mansion was on top of the hill on the east side of the creek, and his large estate was called Argyle. Of the twin mills next to the creek, the Blagden Mill produced wheat flour, while the Argyle Mill produced rag paper and later fertilizer from bone. The mills had likely become less profitable by the 1880s, and after the flood of 1889 operations ceased altogether. The mills stood in ruins in the 1890s and were torn down to make way for the construction of Beach Drive in about 1897. An historical marker currently stands on the site. Remains of the twin Argyle and Blagden mills in the 1890s. Lyon’s (Federal) Mill – Just north of Georgetown stood this large merchant mill equipped with two water wheels, one on each end of the sturdy structure. The two-story mill was made of brick and had a basement level of native blue stone. It probably did more business than any of the other mills along Rock Creek. It was built in 1780 on the east side of the creek just across from the eastern boundary of Oak Hill Cemetery. Lyons Mill Road used to connect it with Georgetown via a bridge over the creek and a road that ran up the hill on the west side of the creek. The bridge’s abutments are now used for a pedestrian bridge over the creek. The mill was part of a 65-acre estate that included a barn, smokehouse, icehouse, carriage house, stable, and two stone houses. The half-mile long mill race, the longest of any on Rock Creek, powered the mill’s two massive water wheels. The mill ground its last flour in 1875, when its last owner died. By the early 1880s it briefly became popular as a rendezvous for “barn dances, picnics, masquerades, and other fashionable functions,” but later was abandoned and fell into decay. The remaining structure collapsed in 1913. The site had an historical marker that was removed by the National Park Service in 2012 when the trail in this area was rehabilitated. 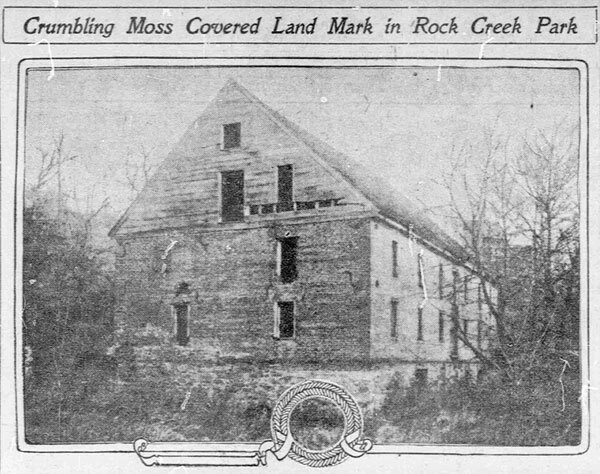 Photo of Lyons Mill from a newspaper article from 1910. Patterson’s Paper Mill – Built around 1800, Patterson’s Paper Mill stood on the east bank of Rock Creek just beyond P and Boundary Streets (Florida Avenue). Later renamed the Columbia Paper Mill, it was operated by Edgar Patterson in the early 1800s and offered for sale “all kinds of writing and printing paper.” The building measured 120 feet long, and rose three stories high, the first story being made of stone. A survey in 1868 showed a single water wheel and virtually no mill race. Instead the mill drew its power from a stream that fed into Rock Creek at this spot. Parrott’s Mill. 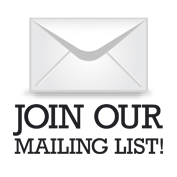 – Little is known about Richard Parrott’s Georgetown Wool and Cotton Manufactory located approximately at the present corner of 27th and Q Street, near Dumbarton House on the heights above the creek. The mill, on the same road that served Lyon’s Mill down on the creek, carded wool and spun cotton. It was in operation in 1813 and supported a household of five people. His home, “Elderalie,” was north of Georgetown in what is now Montrose Park. Nothing remains of Parrott’s Mill. 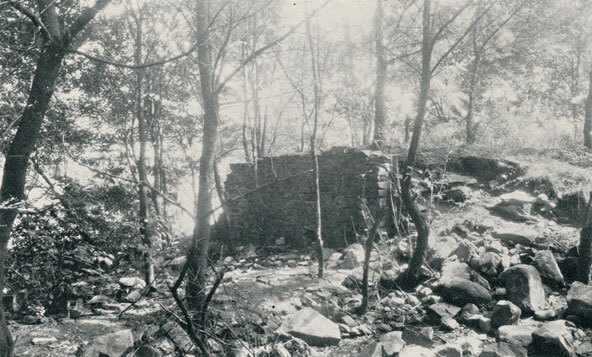 Ruins of Parrott’s Mill in Georgetown, circa 1930. 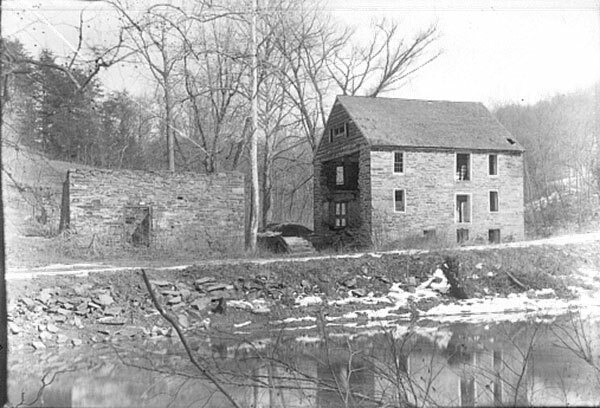 Other Mills – White’s Mill (circa 1634) and Peter’s Mill (before 1800) were located upstream of Peirce Mill and Blagden Mill, near Military Road. They were two separate mills constructed at different times. Because of the creek’s geography, this section offered the greatest water power. There is no evidence that Peter’s mill was in operation after 1800. The remains of the mill race and the foundation of the mills were obliterated by the early part of the 20th century when Beach Drive and other roads were constructed in this area. Other mills located outside of the District of Columbia (in what is now Maryland’s Rock Creek Regional Park) included Jones Mill, Duvall Mill, Bowie Mill, Plyer’s Mill, Beall’s Mill, Viers Mill, Beckwith Mill, Horner Mill, Elger Mill, and Muncaster Mill.